12 x 6 Plastic Decorative Baseboard Cover Discounts Apply ! 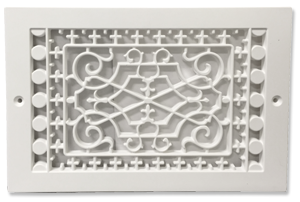 Example: This 12x6 decorative baseboard cover fits a 12 inch wide x 6 inch height opening in the wall. The overall faceplate dimensions of the baseboard return grill measure 14 inches x 8 inches.